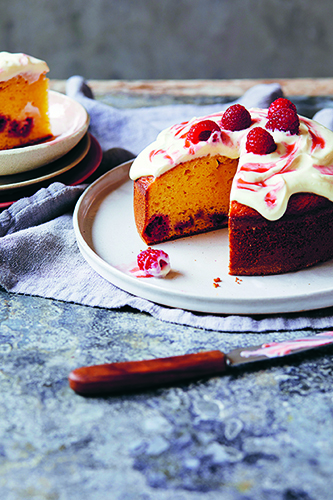 The basic batter truly shines when paired with tangy berries, and the hot pink swirls within the mascarpone and yoghurt topping are as delightful to behold as they are to devour. It’s also a keeper for a school fete cake stall – simply bake it in a 30 x 20 cm lamington tin and cut into squares. The cake can be made a day ahead, then wrapped well and stored at room temperature. Ice with the mascarpone mixture just before you are ready to serve. Preheat your oven to 180°C and grease and ﬂour a 20 cm round cake tin. Make the batter as instructed. Add 100 g of the raspberries and gently mix them in. Pour the batter into the tin and bake for 35–40 minutes or until golden brown and a skewer inserted in the centre of the cake comes out clean. Cool in the tin for 10 minutes, then transfer to a wire rack to cool completely. Just before you are ready to serve, beat the mascarpone with the yoghurt and icing sugar. Drape the mixture on top of the cake to form soft waves. Crush the remaining raspberries (minus a few for the top of the cake) with a fork, and pass them through a sieve, then add the juice to the mascarpone mixture, swirling gently to create a pink, streaky pattern. Scatter a few raspberries on top and serve.